What are the biggest takeaways from the bitterly fought Gujarat election? Some would say it is the BJP's remarkable winning streak of six consecutive state election victories - just one short of the CPI(M)'s record run of seven triumphs in a row in West Bengal. Others would say it marked Rahul Gandhi's coming of age for he emerged as a feisty campaigner shedding the uncharitable "Pappu" tag often attached to his name. Still others might point to the appearance of powerful (caste) identity barons like Hardik Patel, Alpesh Thakor and Jignesh Mevani. But there is yet another takeaway which may have significant implications for the future. 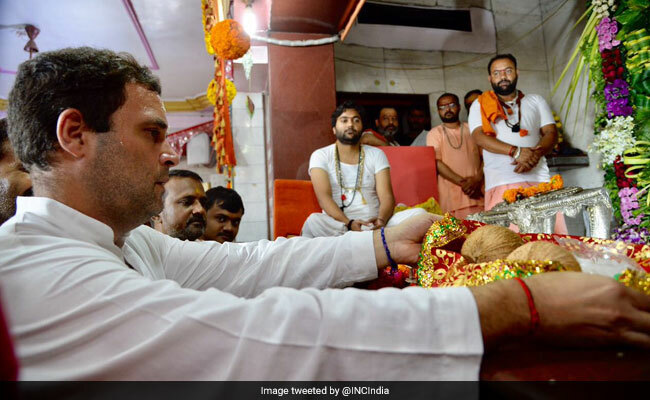 That is Rahul Gandhi's emergence as a janeu-dhari, temple-hopping Shiv-bhakt Hindu who even permitted an unprecedented puja and havan to be performed inside the AICC office when he took charge as Congress president. It may be premature to suggest that under his tutelage, the Congress party shall shed its hard-line secularist tag, which was widely criticized for becoming shorthand for minority appeasement. Whether this was only a tactic for neutralizing the BJP's Hindu edge in a state often called the "laboratory of Hindutva" or marks a deeper change in ideological predilection remains to be seen. Having gone quite far in asserting his Hindu identity for the first time since entering politics, the Gandhi scion will find it difficult to backtrack. There is no doubt that this transformation helped the Congress to duck the BJP's regular allegation that the Nehru-Gandhi family is not only non-Hindu in its beliefs but also anti-Hindu in its politics. Arguably, this did not stop the BJP from insinuating that the Congress's hidden agenda was to anoint "Mian" Ahmed Patel as Gujarat Chief Minister in case the party won. But the charge did not carry the same conviction as earlier allegations on similar lines. If Rahul Gandhi sticks to his newly-discovered identity he would, in a sense, be taking the Congress back to its pre-Nehru avatar. Till his great-grandfather became Prime Minister and overwhelmingly dominated the Congress party after the death of Vallabhbhai Patel, the Congress was widely seen as essentially a Hindu party as distinct from the overtly religious Muslim League which was busy agitating for Partition through violent means. Any student of modern Indian history would know that British administrators defined the Congress as such, despite Nehru's loud protestations of secularism being the party's inalienable creed. But despite all his attempts, Muslim voters opted for the League in the 1936-37 elections held under the Government of India Act of 1935. In UP for example, the Congress won a huge mandate but could not ensure the victory of even a single Muslim candidate. 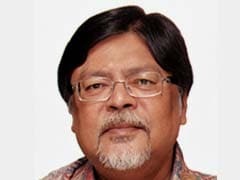 A stalwart like Rafi Ahmed Kidwai too lost at the hands of a young League contender. The 1946 elections to the Central Legislature (the franchise was still limited), replicated the same result. Although bitterly disappointed, Gandhi, Nehru and Patel had to reluctantly concede without saying as much that Jinnah had indeed won his argument that the Muslim League was the "sole spokesman" of his community. Jinnah treated Congress Muslim leaders such as Maulana Abul Kalam Azad and Kidwai with disdain even referring to them disparagingly as "showboys". Post-Independence, the horrors of Partition and Nehru's overarching personality helped the Congress to shed its Hindu tag. Gone were the days when the AICC and Hindu Mahasabha held their annual conference concurrently; Madan Mohan Malviya could become president of the Mahasabha one year and that of the Congress in the next. But after resoundingly defeating pro-Hindu elements like PD Tandon after Independence, Nehru successfully put his secular stamp on his party - a tradition carried forward by his daughter except in her last years in office. But whereas Nehru was personally a committed agnostic, Indira Gandhi was a believer in her personal life, but aware of the importance of the Muslim vote, she played the secular card with great dexterity. Her ministers, notably Moinul Hoque Choudhury and even Fakhruddin Ali Ahmed, were often accused by the Jana Sangh of working towards a demographic transformation of Assam by helping Muslim incursions from erstwhile East Pakistan into the border states of the North-East. The Muslim appeasement tag seriously stuck to the Congress in the aftermath of Rajiv Gandhi overturning the Shah Bano verdict through his brute parliamentary majority in 1985. To offset this, the relatively young Prime Minister ordered the opening of the locks of the Ram Janmabhoomi in Ayodhya where idols of Ram Lalla had been placed in 1949 under the domes of the Babri Masjid. The rest of course is well known and Hindutva sentiment spiraled unchecked thereafter. The Congress decided to soft-pedal the matter instead of confronting the rising tide of Hindu assertion. But in the late 1990s and since the beginning of this century, the Congress party's image was decidedly coloured by a hard-line secularist tinge. The rise of several regional outfits such as the Samajwadi Party in Uttar Pradesh and the Rashtriya Janata Dal in Bihar by Mandalite leaders Mulayam Singh and Lalu Prasad Yadav respectively dented the Congress' secularist plank as they aggressively promoted a caste-community plank through the Muslim-Yadav (MY) formula. The Congress, as often claimed by commentators, fell between the stools of Mandal and Kamandal. As long as Sonia Gandhi was formally at the helm of the Congress, any attempt to make a distinction between private Hinduism and public secularism would not have carried conviction. Rahul Gandhi seems to have acknowledged the importance of making that distinction and asserting his personal identity as an upper caste Hindu without hesitation. This will undoubtedly help him, and by extension the Congress party, shed the anti-Hindu label that got affixed to it in recent years. To that extent, post-Gujarat, it is a more level field than before, in which individual religiosity can coexist with a different public persona. 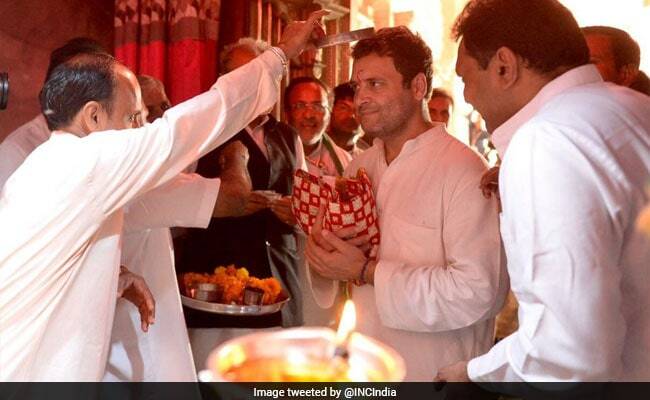 If Rahul Gandhi persists with this, the Congress may regain its old identity and even echo the position that India is secular because its dominant creed is Hindu. 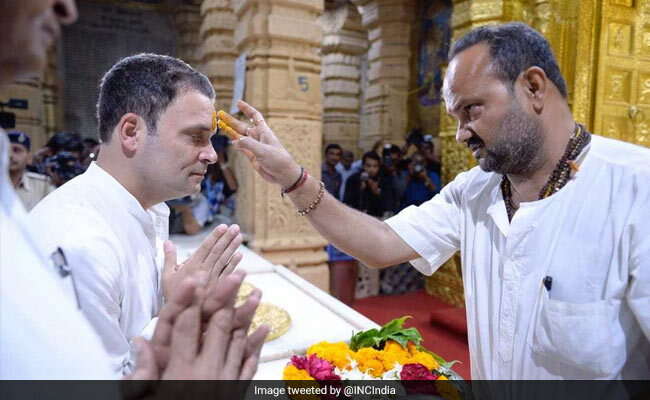 But for that, Rahul Gandhi must demonstrate that his two dozen-odd temple visits in the course of the Gujarat campaign were not superficial showpieces but had deeper conviction. In other words he would need to continue visiting shrines (of various faiths) without appearing to do so for purely political ends. A deeply religious country like ours appreciates believers, and dislikes agnostics. By establishing his identity as a believer, Rahul Gandhi has an opportunity to shed a burden he has carried for long.